Utagawa Yoshitora (active 1850-1880) Actor Portraits Past and Present: Bando Mitsuguro V as Yushide, Daughter of Shindo Saemon, 1862. Oban. Alongside Kunisada’s Ichikawa Danjuro VI as Kakogawa Honzo from the same series, this must be one of the most spectacular prints we have shown (and is the second copy we have exhibited, this being a later impression). The series was Kunisada’s crowning achievement and designed to cap his career with not only daring designs but also an extraordinary lavishness of printing. The great portrait of the onnagata actor is from the play Karukaya Doshin Tsukushi no Iezuto. The plot revolves around the ambitions of rival Daimyo to possess a rare gem stone. A plot ensues which requires a twenty year old virgin (unknown in Edo Japan), as the only person who may touch the object. Yushide is a temple servant who will be tricked into sleeping with Onnanosuke so that the gem may be switched with a valueless black stone and the miraculous transformation blamed on Yushide’s seduction. 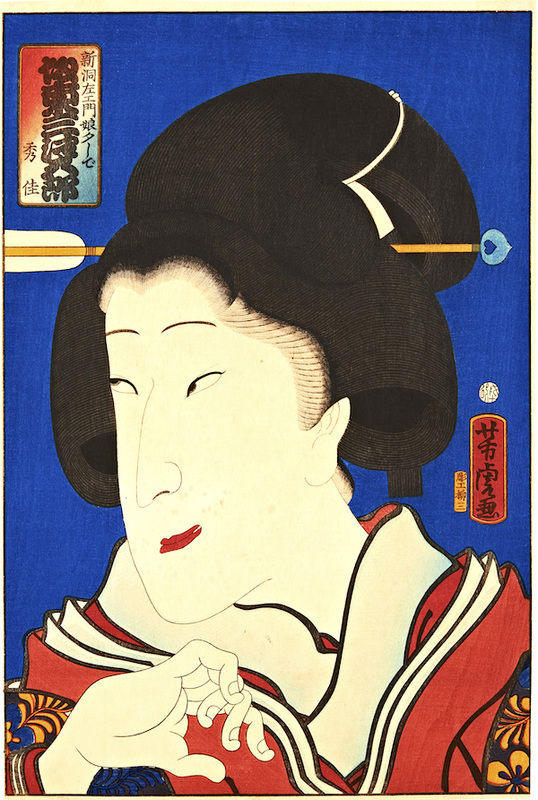 Filled with remorse, Yushide stabs herself in the throat with a white arrow which she uses as a hair pin (seen in the top of the print, beautifully embossed). The rest of the play is typically littered with mounting corpses as various cast members join Yushide in shame or remorse. Okubi-e (large head portrait prints) are generally credited to the artist Katskawa Shunko I (1743 - 1812); other artists excelled at them among whom Utamaro and Toyokuni I are outstanding. The format was banned by the shogunate in 1800 for around a decade but then started to creep back in popularity. This series by Kunisada and Yoshitora revives the tradition but with the cropping of the margin even closer to the subject making a greater visual impact. As mentioned above, although frequently ignored, Osaka artists were frequent visitors to Kunisada’s studio and indeed pupils. Yoshitora’s contribution to the series cannot be underestimated. His twelve prints are all outstanding and benefit from the same dazzling quality of production as Kunisada’s. This fabulous print depicts Bando Mitsuguro V as Yushide, daughter of Shindo Saemon. A very fine impression with visible woodgrain, colour and condition are also outstanding. There are some small paper flaws otherwise very fine, some margins, exceptional block cutting and print quality.